Hello and welcome back crafting friends. 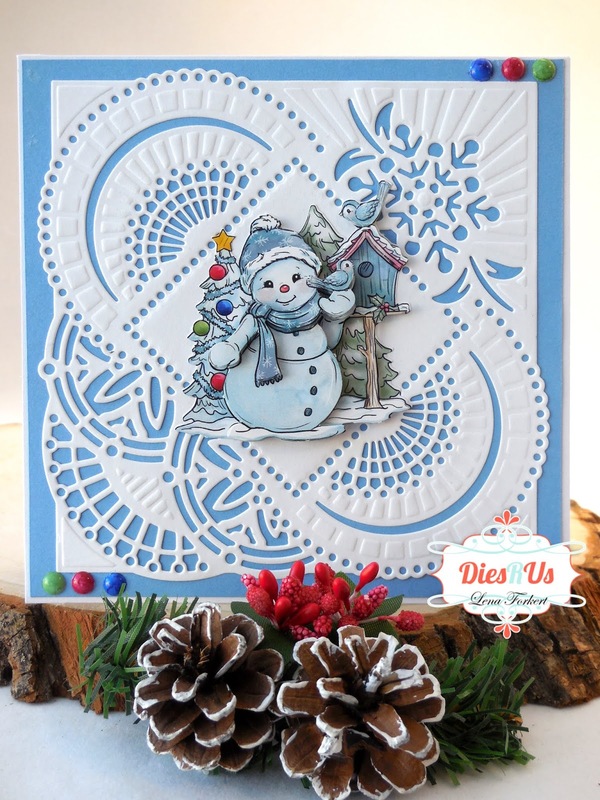 It's Lena with you today sharing three cards featuring some beautiful and easy to use background dies. 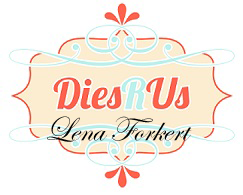 In case you missed the great sale Dies R Us had on international dies last week, and you wanted to create cards similar to what I showed you in my last post, the cards I'm about to share with you today use dies that are always available at the Dies R Us store. I love cutting and piecing dies together as I actually find it very relaxing, but sometimes you just don't have the time and that is when background dies come in very handy. 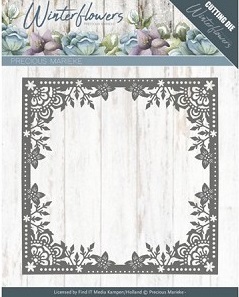 On my first card I used the Ice Flower Frame from Precious Marieke. To finish the card I added a few silver snowflakes and a few silver star sequins. The second card was made using the Mirror Frame from Jeanine's Art. This is such a beautiful die that I didn't want to add anything to it as it may have taken away from the beauty of the cuts and the embossing of this die. I just added a few enamel dots to go with the baubles on the Christmas tree. For my third card, I cut the Ice Crystal Frame from Amy Design twice to add a little bit of dimension. 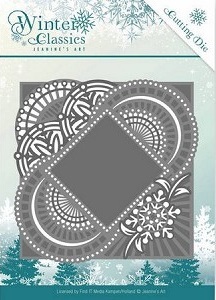 I added a few snowflakes out of silver mirror cardstock. 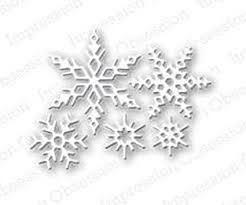 I used a very old set of small snowflakes to cut mine out and I'm not even sure they still around. 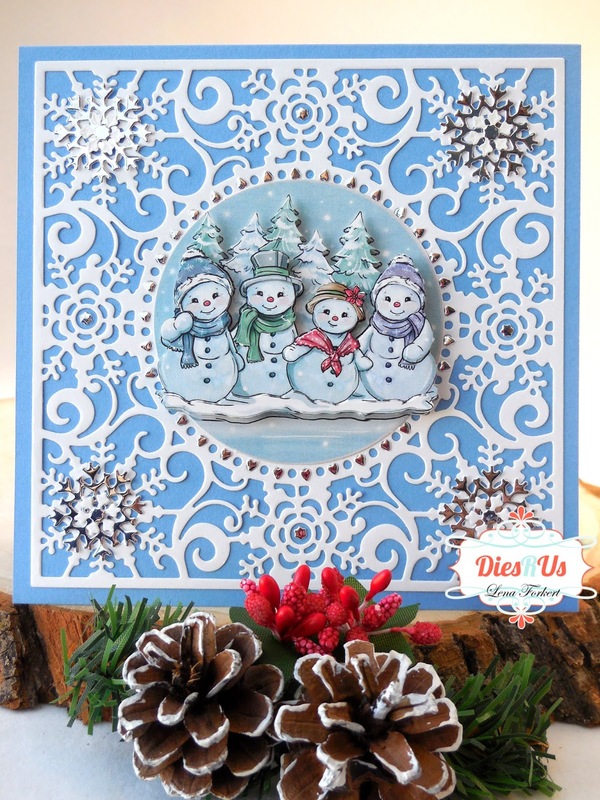 However, if you need a set of small snowflake dies the Small Snowflake set by Impression Obsession is a great set to add to your stash. Now you may be wondering about the cute snowmen I used, again it was a gift from my SIL. 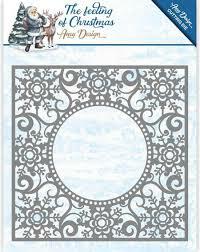 Snow Much Fun decoupage cutting sheet. They are made of 3 layers with foam dots in between each layer to build dimension on the card. Each of these cards measure 5.5" x 5.5". Here is a quick recap of the dies I used with links to the store, for your convenience. 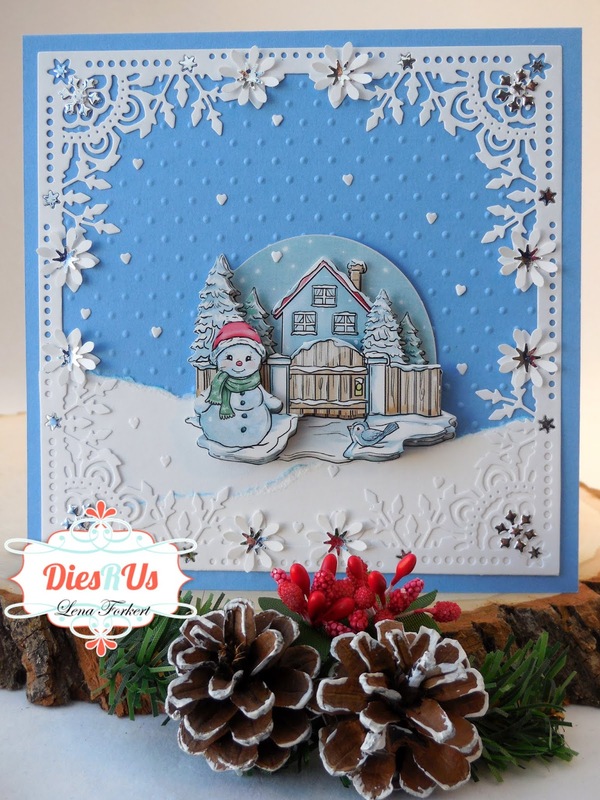 I hope I was able to inspire you to make a project and come play along at the Dies R Us Challenge Blog for your chance to win a gift voucher to the Dies R Us Store. A new challenge begins on the first and fifteenth of every month. Be sure to Follow Us on Facebook too. These are so very pretty! Love them all! These are all just BEAUTIFUL!!! Fabulous holiday inspiration! All are just gorgeous but my favorite is the 2nd one. stunning backgrounds.... need to add these to my must have list. Oh my gosh! Those dies make fantastic cards!